Book now! Limited availability. In-town, 4BR spacious home, walk everywhere! 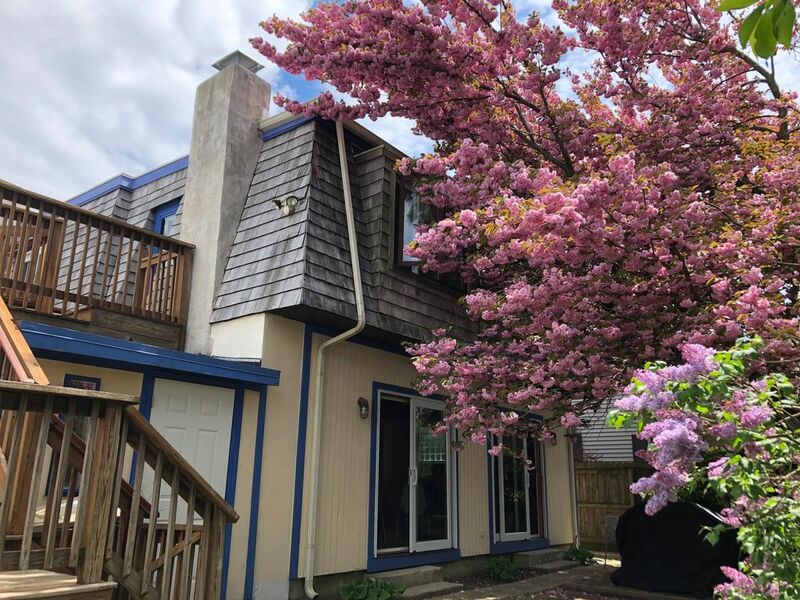 Walk to the beach and downtown restaurants from this comfortable, spacious, 3200 square foot beach house, situated in a quiet residential Rehoboth Beach neighborhood with off-street parking for two cars. (We also provide two Rehoboth Beach parking passes, which can be used on the street in front of our home). Located just 2 blocks from Rehoboth Avenue, 3 1/2 blocks from the beach, and right down the street from the Silver Lake tot lot with its picturesque footbridge over Silver Lake and abundant wildlife nearby. The home comfortably sleeps 10 and is perfect for family gatherings. It is thoughtfully equipped to ensure that you have everything you need to enjoy your Rehoboth Beach vacation. Watch sunsets and starry nights from the large 2nd story deck, and enjoy the private, fenced in backyard with shady trees, patio, gas BBQ, and outside dining table and chairs. Back from the beach? Shower off in the outside shower, just steps from the walk-through mudroom with washer and dryer. Inside, you'll appreciate the open floor plan with plenty of space to hang out and relax, yet separate conversation areas so you don't always have to be in the same room with everyone! The house cooks will enjoy the kitchen's new, high-quality cookware, abundant new kitchen supplies, stainless steel appliances including a double oven, and tasteful yet beachy decor. The open floor plan includes two separate gathering areas. The large living room opens onto an adjacent sunroom, which provides sliding glass door access to the outside patio and upstairs deck. There is also a small "sitting area" at the front entranceway/staging area. And there is plenty of crawling around space for the kids, who will also enjoy the cute outside ocean mural visible from the dining room and kitchen. An efficient, well stocked kitchen, a half-bath powder room off the dining room, a main level master bedroom and an adjacent laundry/mud room complete the main level. Upstairs, you'll find a large master suite including a bedroom with king-sized bed, a small "bonus room" with access to the outside deck, an ensuite bathroom and a separate vanity alcove with a large, lighted make-up mirror above a built-in vanity. Sit down on the comfy stool, relax, and enjoy a glamorous make-up session! The vanity nook is across from the master bathroom. Along the upstairs hall landing is a bedroom with a queen bed and sliding glass door access to the deck. Right next door is another bedroom with two twin-sized bunkbeds to sleep four. This room also has sliding glass door access to the deck. Both rooms are across the hall from a large bathroom. Each bedroom includes room darkening curtains, a closet with hangars and at least one chest of drawers. The master bedrooms (upstairs and down) also include a chair near the bed. Two fireplaces, a wet bar, beamed ceilings, and multiple sliding glass doors add to the charm. Enjoy the TVs, DVD library, and broadband wireless Internet access. Driveway parking for two cars plus two Rehoboth Beach street parking permits provided. The responsible party must be resident at the house and must be over age 25 unless other arrangements are approved. 4) A contact number you will use during your stay in Rehoboth Beach. 1. PAY IT FORWARD! We operate on a "pay it forward" "Golden Rule" principle. We leave enough supplies for several weeks in case someone forgets an item. Most rentals require that you bring tons of stuff to stock the house. We just ask that you replace what you use (or nearly empty). This way, everyone should arrive at a home that is fully stocked and you can jump out of the car, find a cool jug of water in the fridge and toilet paper in the powder room, and you can relax a bit without worrying about unpacking everything! Before your arrival, please check the Hospitality section of this site, where you'll find a detailed listing (including photos) of everything waiting for you at the house, from spices to beach gear. 2. DAMAGE? PROBLEMS? CAN'T FIND SOMETHING IN THE HOUSE? CONTACT US! Please don't wait until after your vacation to tell us of housekeeping or other problems. Let us know so we can fix it! 3. No smoking, no pets, sorry! 4. No renters under age 25. PS - When returning from the beach, we'd appreciate it if you could try to enter the house from the side door, near the outside shower. You can hang towels along the fence or decks or on the inside hooks, and walking through the mudroom minimizes the sand tracked through the house, enabling you to better enjoy your stay. Yes, we know - our kids don't always abide by this rule either, but we try! Please do the same - you'll be glad to keep the house cleaner this way. BELOW ARE COMMENTS LEFT FROM PREVIOUS GUESTS IN OUR HOUSE GUEST BOOK. WE LOOK FORWARD TO READING YOUR COMMENTS TOO! We rented in Rehoboth Beach before we bought our house, and we've used our experience with rental houses to make our home comfortable and accommodating for vacationers. We fell in love with Rehoboth Beach because we thought it was the closest thing to a California beach town near DC. There is so much to do - we've been coming now for more than 10 years and we still haven't been everywhere or seen everything in Rehoboth! The City of Rehoboth Beach is a small town with a small town feel (even though they call it a city!) We love the beach, the boardwalk, the lakes, the sidewalks, the shopping, the restaurants, Funland, and more. It's quaint yet sophisticated, with kitsch thrown in... It's unique, it's Rehoboth. Please read below about the unique benefits of renting our home. We are close enough to walk to the beach and Rehoboth's many downtown restaurants and bars, yet far enough away that it is not as noisy as some of the properties closer to the beach and the commercial district. There are a lot of year-round retiree residents in our neighborhood. It makes it a 'real' neighborhood. We have a lovely fenced in yard with mature trees - a great place for the kids to play and to escape the heat. There's also a beautiful park at Silver Lake Extension, just a 3 minute walk down the street! We price our home so that it is an excellent value, and we monitor other property listings very carefully to make sure that our house remains an attractive option in the competitive Rehoboth Beach rental marketplace. In 2017, we introduced flexible check-in and check-out days, which have been a big hit with our guests. You choose the days. We do require a minimum stay during peak times. This is a very hard feature to find in Rehoboth Beach. Our home is spacious and relaxing with an open floor plan. We renovated extensively when we purchased the house in 2004, made additional updates in 2014, and just finished a major "decor update" during the spring of 2017. We love our house and wish we didn't have to rent it out each summer! That said, we enjoy our guests, some of whom have been returning for many years. We take our guests' input seriously, and they've helped us to make many upgrades to the house. We take guest feedback very seriously and encourage guests to let us know how they enjoyed the house, and how we might make them even more comfortable in the future. toilet, combination tub/shower, Includes two sinks. Located upstairs btw Bedrooms #2 & 3.
toilet, Located on first level. In-town Rehoboth Beach, an easy two block, five minute walk to Rehoboth Avenue, near Dog Fish Head. 15 minute walk to beach. Close to everything, yet quiet neighborhood. Near Silver Lake Extended. Just 3.5 blocks to the beach, about a 10 - 15 minute walk. The City of Rehoboth Beach is the nation's "summer capital," a small town that draws visitors from all across the country. Many families return year after year. Located in laundry room/mudroom off of outside shower - so convenient! Since we have an HE washer, we even supply the detergent! Located in laundry room/mudroom off of outside shower - so convenient! Shower and throw your dirty clothes in the wash! Upstairs and downstairs networks for maximum connectivity! Cold filtered water waiting in the fridge for you! Double oven -- cook multiple dishes at two temperatures at once! Double oven; two cooking zones - a cook's dream! We have two - a large 8-cup capacity and a smaller 4-cup model in case you wish to make both caffeinated and decaf. - Nice arrangement of spices; - Plenty of cutlery and cookware; - Plastic wraps, bags; Please let us know if you have a special request! Plenty of nice, matched dishes and utensils. Kitchen recently renovated (as was house). Cook's dream...double oven for those big meals; all stainless, beachy but tasteful decor. Cut-through from living room to kitchen and sunroom, so you can still feel part of action while cooking. inside dining table seats 8, with another table in sunroom that seats 4. Outside table seats 6 and upstairs deck table seats 2. A delightful summer library includes paperbacks and magazines. Outside basketball court - regulation size - in driveway. Be sure to bring your basketball in case ours goes missing. Card games and board games galore. Cable package includes popular music from each decade. Family-friendly DVDs and videos stored in living room for your viewing pleasure. Everything from 'Elmo's World' to 'Austin Powers' to 'Planes, Trains and Automobiles' plus more! Shady back yard - we have more trees than anyone else south of Rehoboth Avenue! Look at our drone pictures to get an idea. We love relaxing outside on the patio in the shade of the big cherry tree. Fantastic upstairs deck accessible from three rooms (upstairs queen bedroom, upstairs bunkbed room, and room off of master bedroom). Lovely upstairs deck, beautiful sunsets to view. Chaise lounges and small table and chairs for relaxation. Both! Patio is right outside sliding glass doors from sunroom. Shaded and private, comfy chairs, lovely spot to eat and relax. Tennis courts at Rehoboth Elementary School, a short walk down the street and across the picturesque bridge over Silver Lake Extension. Public tennis courts also available closer to the beach. There are many nice golf courses a short drive away. Large, private, shady, fenced-in back yard, perfect for kids, accessible through sliding doors from sunroom; outside shower with access to house through laundry/mudroom; 2nd floor large sun deck; walk to Rehoboth Ave, beach, Silver Lake and tot lot. We've also just added a basketball hoop! Conveniently located and very spacious. We totally enjoyed our stay! The decor of the house is lovely and relaxing, just right for vacation. The kitchen is well-stocked. We really enjoyed our stay and the home was very nice. It was very roomy and very clean. The owner was very nice and very helpful. I loved that it was so close to the boardwalk and beach. Very nice walk to beach. My family and friends had an amazing time at Rehoboth. The houses proximity to Rehoboth Avenue and the beach was amazing and made our trip very easy. The house was very well stocked with everything we could want to use at the beach such as chairs, umbrellas, sand toys, and a beach blanket. It was nice no to have to bring these things along, the kitchen was also well stocked along with paper products, dishwashing and laundry detergent, and hand soap. I appreciate the pay-it-forward concept, felt very at home. The beds were very comfortable and we had quite enough space for six people. The long weekend was complete beach therapy! Lynn's house far exceeded any expectations. It was so roomy, and yet cozy. I adored every inch, as did my family. We played games in the spacious living room, watched Shrek, had a great time at the beach and hanging out. Was an incredible opportunity for my family to heal.it was a dream house, each bedroom was amazing, the upper deck had incredible star gazing. Furniture was comfy and inviting. My family cannot wait to go back to our "home away from home". Thank you Lynn! Love the pay it forward concept. Great home for kids. Rachel, thank you for choosing to stay as our guests. I really enjoyed chatting with you and the back and forth online, and appreciate the wonderful care you took of NuNuBeachHouse! Looking forward to meeting you “IRL” next June! Walk right down the street to the beach, downtown, or Silver Lake Extension, a beautiful freshwater lake teeming with fish, turtles, otters, egrets, and other wildlife. Walk over the picturesque footbridge to the tennis courts on the other side. •	Without trip insurance: If you have to cancel your reservation after receipt of your first payment, the cancellation fee is 15% of the weekly rate if the property is re-rented. If the property is not re-rented all monies paid are forfeited. •	With trip insurance: The cancellation policy is determined by the insurer. Weekend rentals require an additional $100 cleaning fee.